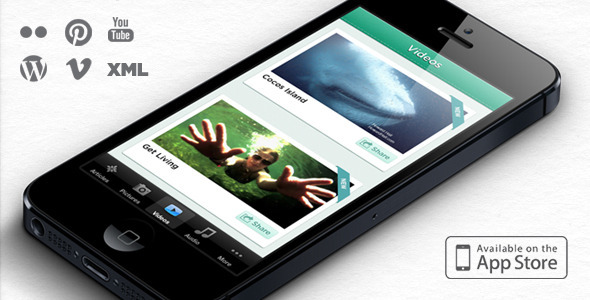 Emerald is a native iPhone app template that allows to create a 100% customized app without a single line of code. We used gotham medium on the demo and the AppStore version. We have replaced it by TitilliumText25L004 (free front) in the template. For more informations on the way Emerald works you can check our online documentation. Choose your features : the tab bar is a great way for the user to navigate within an iPhone app. By using this navigation system you are still free to choose the number of tabs, the order and the features (Articles, Images, Videos, Audio, More) in it. Articles : hook your articles from WordPress or XML. Emerald is automatically taking care of the data linking process for you. HTML and CSS are supported for your articles. Images : load your Pinterest, Flickr images or choose XML to select each photo. Amaze users with your HD and stunning pictures ! Videos : link your Youtube or Vimeo account to Emerald in few seconds. XML is also available if you are using a custom HTML5 player or if you want to select each video. Audio : play an unlimited number of tracks or radio stations in your app. It is incredibly easy to update the songs/radios in real time. More : let the user know more about your work. Redirect them to any website, add a biography or a description, show your location on a map, insert any label you want. Share : the entire content of the app can be shared. Increase your traffic with Social Networks ! Real time data : WordPress, Pinterest, Flickr, Youtube, Vimeo, XML, Emerald takes care of your data. As soon as you add new content users can look at it in the app. Reading list : users can store their favorites articles in one touch to the reading list. A great way to enjoy your content offline. You can deactivate this feature. Languages : English, Madarin, Korean, European, etc… you can change the entire app language. Give your users an app they can easily interact with. Easy configuration : you don’t have experience with code or Objective C ? Great because you don’t need any programming skill to configure Emerald. Full customization : from the font to all images, you can customize the entire app. Clean code : if you are more advanced you can easily edit and change Emerald’s code. We made it clean. Support and documentation : Emerald comes with a complete tutorial from your first experience with Xcode to the AppStore submission. Our team is providing support under 24 hours to help you get the work done. Can I add a single feature multiple times ? As we promised you can customize the entire app, and if you want you can have 5 tabs with only articles, or any other feature. I am not using WordPress/Youtube/Vimeo/Pinterest/Flickr, how can I add content ? Don’t worry, Emerald is fully compatible with XML. What do I need to submit the app to the AppStore ? Do you provide any help to submit the app to the AppStore review ? You will need a paid iOS Developer Account. We have created a step by step tutorial to submit the app to the AppStore. I don’t have any iOS device. How can I test the app? Xcode comes with the iPhone simulator and it allows you to build the app and interact with it like a real device. Contact us if you have any request for the next update! We will read every suggestion. We can keep talking about Emerald but the best way to discover is to test it in your own hands. Download it on the AppStore or try our demo.